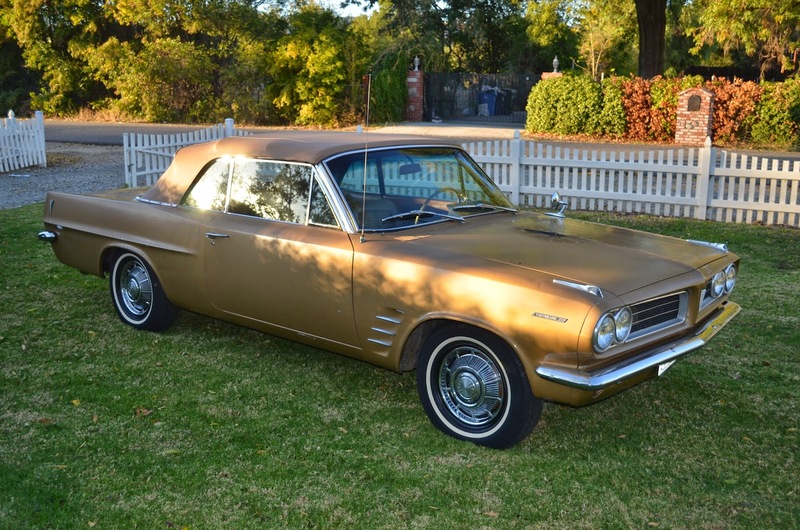 The first generation Pontiac LeMans was a top of the line spec of the Tempest when it was launched in 1961. The LeMans/Tempest was later famous for being the platform that John DeLorean (with engineering help from Russell Gee and Bill Collins) turned into the GTO, but first it was the home of a lumpy half baked engine called the Trophy-4. Find this 1963 Pontiac LeMans here on eBay currently bidding for $3,966 with 1 day to go, located in Simi Valley, CA. This LeMans is covered with a faded coat of gold paint and shows some rust around the rockers, but looks like a good car to drive as is. The seller (a dealer...flipper?) indicates that the engine was rebuilt a few thousand miles ago and runs as good as it did when new. Under the hood is a misshapen lump that looks like a V8 that is missing a cylinder head and half its pistons...which is essentially what the Pontiac engineers did. 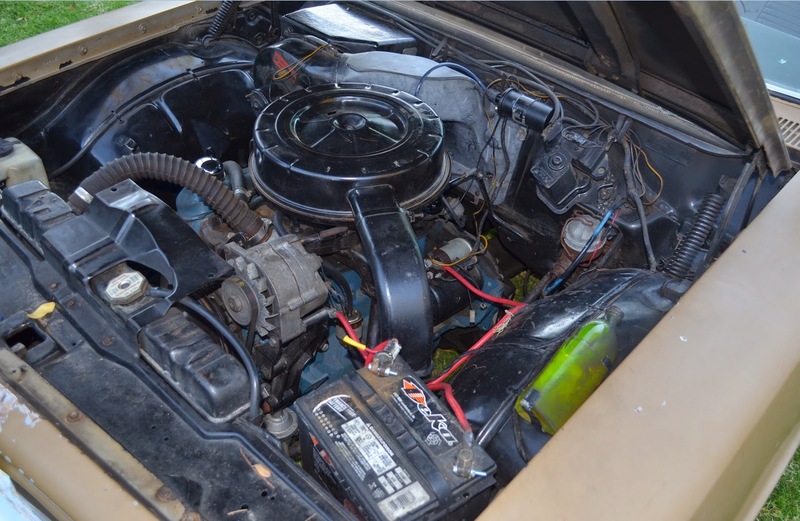 All the V8 smoothness was replaced with the filling rattling goodness of a 3.2 liter inline-4 and power was transferred via Pontiac's rope drive to the rear mounted transaxle. The 4-barrel carburetor fed version of the Trophy 4 puts out 110 SAE gross horsepower and this one has a 4-speed manual transmission. 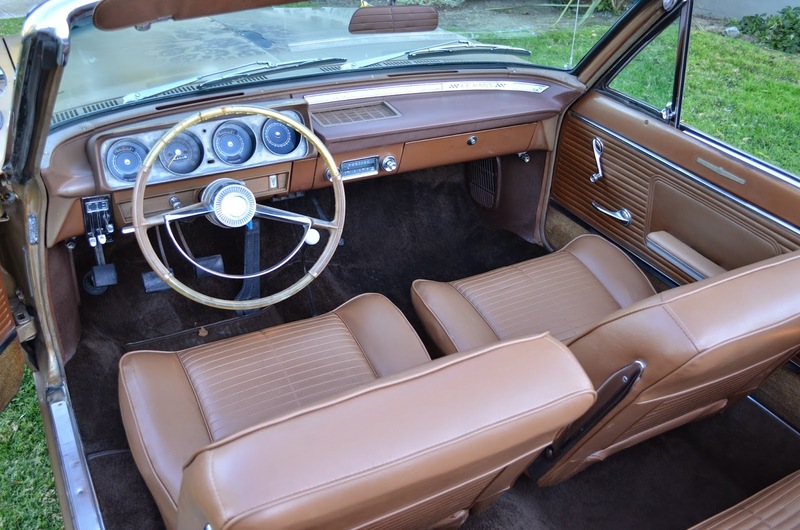 The interior is in good shape (it has probably been restored recently, seats and door cards look way too nice to be original), but it could use a new steering wheel. My understanding is that this engine, while not inherently balanced, was over built because the crank and bearings were designed to handle 8 cylinders. For this reason it could be tweaked to enormous output. Interestingly, the Tempest was available with this 4 cylinder and a lighter and more powerful aluminum 215 V8 simultaneously. These things had the engine hung off a long mount from the transaxle, with a curved tube connecting the transmission to the engine, and a flexible steel-bar driveshaft inside. GM was kinda adventurous back in the late '50s, early '60s, with the Bendix mechanical injection, the C3 'Vette, the Corvair, the Tempest, the aluminum Buick V8, and a few others. Every one of 'em was a bit of good and a bit of bad, and instead of fixing the bad and keeping the good GM mostly threw everything out. The last spurt of innovation was the Vega, which failed not because of the clever bit - the high-silicon sleeveless AL block - but because of the cheap head gasket and iron head bolted to it. When GM panicked the Germans bought up the rights and a substantial proportion of all the BMWs, Benzes, Audis, and wet Pooches from the late '70s forward were built with the same technology. Anyway, as far as the Tempest goes, ran across a '64 wagon with a for-sale sign on it during a morning run while visiting a relative in SoCal last year. If I didn't have a ten year backlog of projects lined up it would have been tempting. Depending on where the bidding goes with this one, the car to buy here in Cali may be this 1963 with a 326 c.i. V8. According to wikipedia (never ever wrong), the 326 with the HO options (evidenced by the duals) put out 280 gross hp. With the intrinsic balance of the rope drive/rear transaxle design, I bet it's a nice driving car. Not a LeMans so kind of curious that it has the 4sp on the floor, but maybe it was bought by originally by someone who wanted a more stripper look. Notice the difference in the rear lights versus the bar lights on the Le Mans. I wonder if this is the original drivetrain on this particular car. Is there a reason the price is so fantastically low? 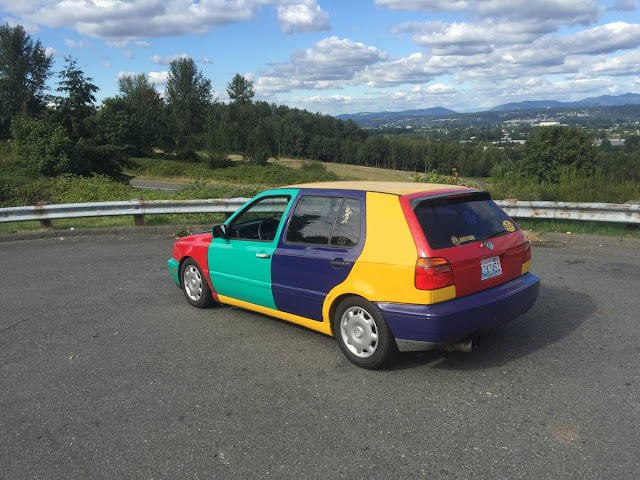 This seems like a perfect candidate for an engine and brake swap and some delightful driving. I owned a V8 automatic for about six years till 2000. Drove the heck out of it. Found a guy here in SoCal who has the rope drive mounts as mine were shot. Terrifically balanced car and I only wish I had had a 4 speed in it. MIne was black over black. I like this color, sort of a gold. Looks like many folks have had their hands in this car. The fact the top doesnt go up and down is worrisome. Forget about putting it up and down by hand unless you'vr got two people.......too damn wide for leveraging most times. Ask me how I know. I wish the seller had shown the underside and had more information on the original state this came from. Kind of doubt it was a California car given it's rust. Mine came from Oklahoma on a flatbed and it was rust free. Go figure. I really like the aesthetics of this design. In may ways its prettier than the next iteration Tempest/LeMans. I was ahead of the curve AGAIN! The hood appears to have a burn mark.